It's the last day of 2012 today! I always get quite nostalgic on the last day of each year, I find it so strange that after today it will never be 2012 again - it's quite sad really. Plus, 2013 sounds so weird and futuristic-y...or is that just me? Annnyways, a few days ago I discovered this little project - 'The Memory Jar' or 'Good Times Jar' and I love the concept. 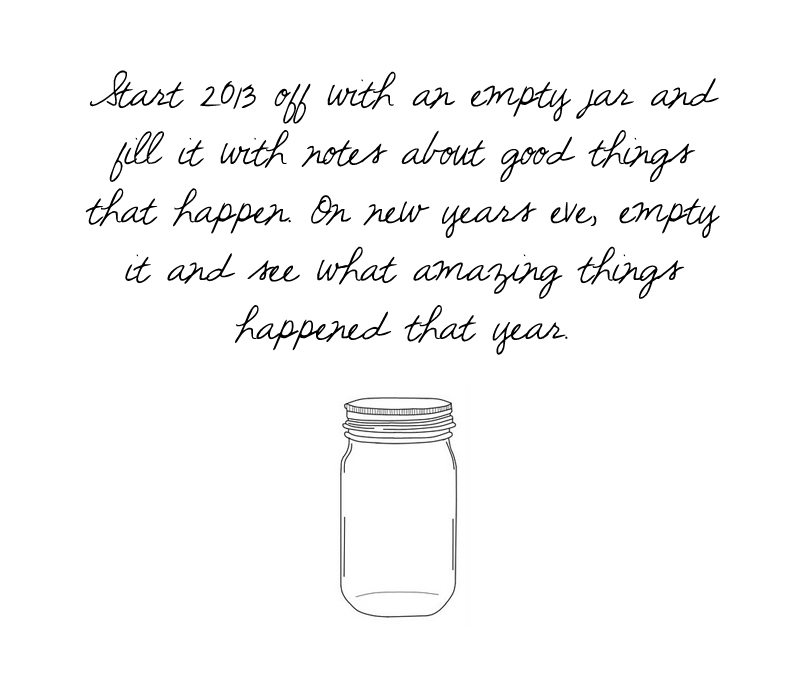 The idea is that you start 2013 with an empty jar and each time something makes you smile during the year, you write it down, fold it up and place it in the jar. On New Years Eve you tip the jar out and reminisce the best times of the year gone by. I love the idea of making the jar look all pretty and archiving them for years to come, I think it's really cute to be able to look back and remember the good times you may have forgotten. I hope you all have an amazing New Years Eve, however you're celebrating! i saw this online somewhere recently and have been determined to do it next year as well! it seems like such a good idea, it will make next New Year's eve so special! I absolutely love this, definitely going to have to give this a go! It's great to see your posts again & the memory jar sounds like such a cool idea, I think I may just have to do it! have seen this before and will definitely do it (if i dont forget it ooops)! I did this over summer! It's such a lovely idea and makes you feel all nostalgic. I've bought a new jar to do it this year as well! Hopefully it'll give me a few smiles next New Years Eve. Anyway you have a wonderful blog! I hope you have a lovely new year! That is such a cute idea! I am so glad that you are blogging again! I missed you! I have a question post going on right now, please go and ask me anything you would like!